If you are looking for the one place which will entertain any age group, head to the Cristo Luz. 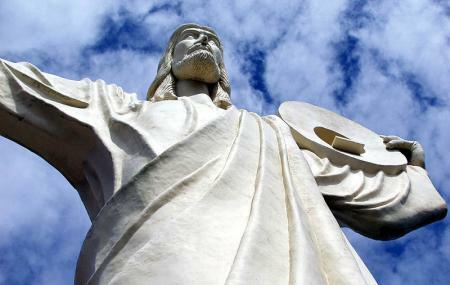 The highlight here is the ‘electric Christ’ monument which is Balneário Camboriú’s own version of Christ-the Redeemer standing at a height of 33 meters. The statue is known for its iconic figure of Christ holding an electric light which symbolizes the sun. The tourist complex itself has restaurants, kid’s play area, pizzeria and fine dine options along with a panoramic view of the whole city. How popular is Cristo Luz? People normally club together Balneario Camboriu Shopping and Central Beach while planning their visit to Cristo Luz. Nice attraction which gives a great view over the city. Big statue of Christ which is fine if you're into that kind of thing. Food and drink not nearly as expensive as some reviews make out. We went early so it was quiet, and we had a place on the terrace and service was fine and we weren't rushed at all. Delicious food and wonderful drinks. The statue is amazing and the museum and photos very cool. You should take Uber to the gate, then they drive you in a shuttle up the hill to the statue and restaurant/museum/gift shop. We went at night and a band played Brazilian and American songs. Pretty view. Facilities are very clean and well cared for. Other than the view, the attractions are somewhat tacky and limited. There is a nice historic pictures exhibit about Balneario Camboriu beggining in the 20th century. The pizza restaurant serves excellent pizza. Beautiful at night! It's like being inside a movie. Nice place. Good view of the city.